a link will be sent to the email you provide. Organizations are increasingly using a variety of platforms and cloud services, and cybersecurity must keep up with the demands and fundamental changes in the computing landscape. Securing cloud infrastructures requires you to understand what is different about today’s data centers, and also embrace the benefits of DevOps as a means to codify cybersecurity practices and controls. This white paper with ESG discusses today’s security priorities and the need for a security strategy that can be used across heterogeneous public and private clouds. 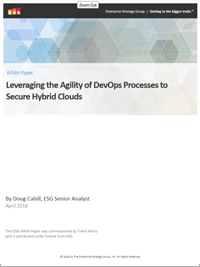 Read the white paper to learn more about leveraging DevOps processes to secure hybrid clouds.